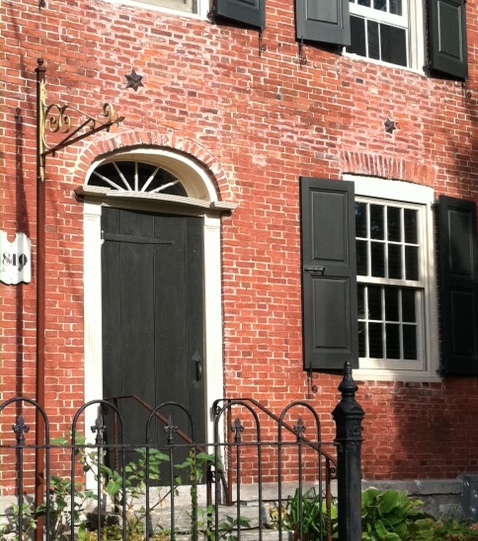 Historic brick homes like this one, built in 1810, have an exterior look to maintain. Many are under the control of town boards that determine what changes can be made to the house. But even if you own an old home or are considering buying one that is not in an historic district, don’t even think about replacing the wood shutters with easy-maintenance vinyl or the wooden front door with fiberglass. Exterior “upgrades” that only consider the time management issues of the homeowner are not upgrades at all. Instead, embrace your older home and its history. Preserve the look by choosing a paint trim color that is not too new-looking. A gray, beige, or grayed-white will give an aged look to the trim that is appropriate for the age of the house. Charcoal instead of black will give the shutters and door a faded-black look that freshens up the paint job without destroying the look of the house. Use wrought iron or brass for your metal instead of nickel (too contemporary). And use native plants for your landscaping instead of the current, most trendy flowering shrubs. Buck the urge to over-improve with new man-made materials. Let’s preserve as much history as we can! You are currently reading Choosing Shutters and Trim for Historic Homes at Your Home & Color Coach.